Ft. Bush was one of the earliest outposts established during the settlement of Liberty. 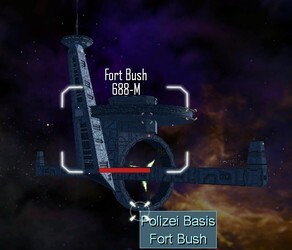 As Liberty expanded, Fort Bush became a popular jumping-off point for any number of wild business ventures as explorers set out to make their fortunes among the stars. Today Ft. Bush provides a haven for traders from all over Sirius who have business to conduct in Liberty. A branch of Liberty Police, Inc. (LPI) headquartered aboard the station helps maintain the peace necessary to a free economy by suppressing pirate activity in the debris fields and administrating automated weapons platforms that defend the nearby Trade Lane junction.